Glitter Bay Suite 204, or “Frangapani,” on the coast of Barbados, offers the convenience of a condo combined with the utmost in privacy. The two-bedroom rental has been remodeled and has a color scheme and furnishings that complement the tropical atmosphere. The open floor plan and 1,300 square feet of living space make it easy to enjoy being indoors; the living area has plenty of seating and entertainment options. The air-conditioned master bedroom has an en-suite bath and balcony access. A second air-conditioned bedroom has two twin beds and a second bathroom is right down the hall. Prepare your meals in the full kitchen, or order from one of the nearby restaurants in Holetown if you prefer. The beach and pools are just steps away, where you can lounge, swim, or snorkel the day away. Holetown is just minutes away and you can get everything you need, from groceries to a night on the town. Beachfront and close to Holetown! Glitter Bay Suite 204, “Frangipani,” is a two-bedroom apartment which has been remodelled and refurbished. It has approximately 1,300 square feet of living area with a large, open floor plan. The large air-conditioned master bedroom, with ceiling fan and personal key safe, is en-suite and has a king bed, pine wood furnishings, and leads out to the balcony. The furnishings are in muted tones of gold and rust. The en-suite bathroom has a glass-enclosed shower and single sink vanity. The second bedroom has two separate beds which can be made up as a king bed. This bedroom is air-conditioned with ceiling fan, pine wood furnishings, and gold and rust color scheme. There is a small TV and DVD player. The second bathroom, located in the hallway, has a curtained, screened bath and shower combination and a single sink vanity. The large kitchen has wrap-around counter tops, large sink, large fridge/freezer, microwave, dishwasher, electric counter top hob and oven. The fully-equipped kitchen allows guests to prepare their own meals or let the nearby patisserie in Holetown prepare and deliver meals right to the door. Being close to restaurants, cafes, and bistros, guests can also dine out. The living area has two- and three-seater sofas. The cream and taupe color scheme is complemented by prints. There is cable TV, 32-inch LCD TV, DVD player, and a CD player. The living area and the master bedroom lead out to the large balcony. Here you will find a dining table for six and a large banquet area with mini bar and wine cooler which is perfect for drinks or relaxing. 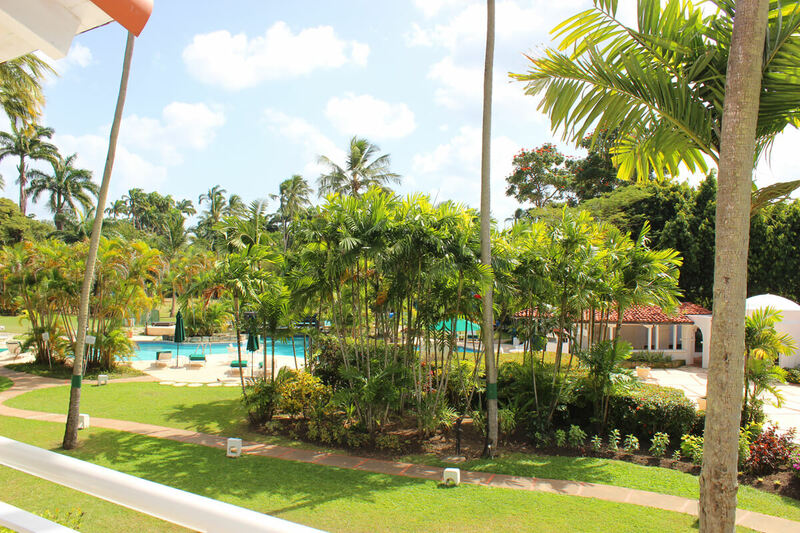 The balcony has extensive views of the gardens, pool, and sea. Can be arranged for an additional cost.